After having some drinks and writing in my diary we continued the trail to out last night. Since '96 it is normally no more allowed to spend the night at Intipunku or the 'Gate of the Sun'. If one doesn't make a fire and do their best not to endanger oneself there are any problems expected by the two night watchmen. 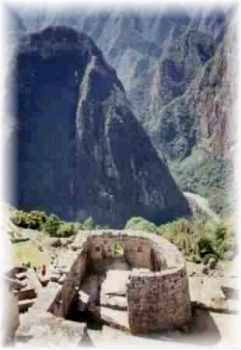 We arrived there at late afternoon and had to say good-bye to Zenon and the two chasquis because they didn't stay with us and continued through Machu Picchu until Aquas Calientes. It was an emotional farewell and after giving them their well-earned propina they left us. Luckily some English persons had the same idea as us and we could use their fire to cook and have some hot thee. 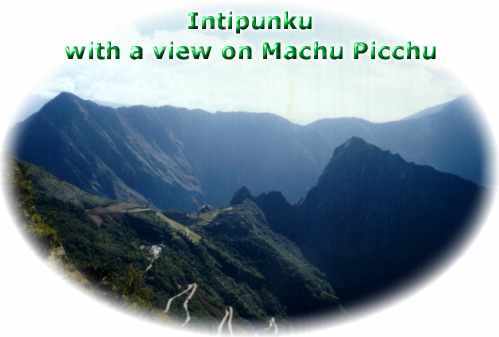 Many people stayed there to be part of the sunset of the Inti Raymi in Machu Picchu. Love your site, great pictures and commentary!